The SA Innovation Network (SAINe) hosted the ‘Keeping the COFISA Communities Alive’ conference on the 23rd of March 2011, at the Development Bank of Southern Africa’s Vulindlela Centre in Midrand. The event was a platform for the five communities that were initiated from the COFISA pilot programme to share their work and experiences. COFISA was launched in September 2006 and was officially closed on the 28th of February 2010. The conference featured keynote addresses made by Mr Takalani Nameungani and Mr Aki Enkenburg from the Department of Science and Technology and the Finnish Embassy in South Africa respectively. The rest of the day focused on the work, the successes and the challenges of the five COFISA communities, namely, Foresighting, Rural Innovation, Science Parks and Incubators, the Activator Programme and Open Innovation. 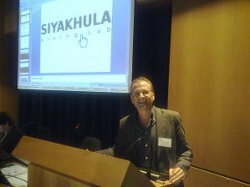 Prof Alfredo Terzoli, representing the Siyakhula Living Lab made a presentation entitled ‘The network of Living Labs in South Africa: The next large research infrastructure by the National Research Foundation?’. In this presentation, he shared his thoughts on how the Living Labs in Southern Africa (LLiSA) network could be considered as a possible Research Centre for the DST/NRF alongside other already established centres.Related presentations were made by Marlien Herselman on the progress and way forward for the LLiSA network, and Ms Rene Parker on the successes, challenges and way forward in RLabs. To date, COFISA has made a very significant contribution to the Siyakhula Living Lab. In 2008 and 2009, it supported the reorganization of the field work in Dwesa and Nkwalini along the lines of the ‘Living Lab’ methodology. COFISA also aided the Siyakhula Living Lab with its integration into the larger provincial system of innovation and in the establishment of the Siyakhula Living Lab Management Unit in 2009.